Have you noticed something different about your Google search results? The link descriptions for search results, or snippets, are longer than they used to be! For decades now, the bright minds on Google’s Search Team have been testing the character limits on these snippets. Recently, Google finally took the plunge and extended the maximum character limit on these snippets from 165 to 320 characters. It seems like a minor detail to base an entire blog post on, but it’s actually a very important update. But, if you search for “first to file prior act,” the snippet for the exact same article changes. In these specific examples, Google has auto-populated each of the snippets based on their queries. However, through most content management tools, you can optimize the snippet that Google displays by editing the meta-description of your page to a searcher’s query. Why should I care about longer snippets? While snippets are, for the most part, created by Google itself, they are the main way to convince a searcher to click on your webpage. 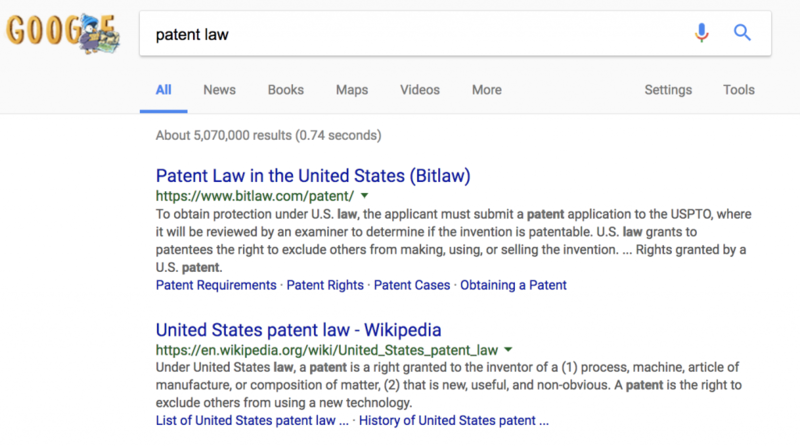 The extension of the character limit on search result snippets means that now more of your content is being displayed by Google. The more content that appears, the more content a searcher can use to determine how relevant your page is to their search. If you have pages with meta-descriptions you have written, you can use this new character limit to your advantage to include more information about your page in the snippet for the searcher. How should I take advantage of this change? There are probably hundreds of individual webpages on your website, so editing each and every meta-description to cater to this new character limit seems like an incredibly daunting task. Rather than spending several hours scouring all of your webpages to edit each meta-description, focus your time on your site’s most important pages, and the pages that receive the most search traffic. From there, you can extend each description to include more relevant information to the page. By making this small change, you can greatly impact your SEO.